Farnborough, together with the parishes of Cove, Hawley with Minley, and Yateley, was incorporated under Gilbert's Act of 1782. This allowed it greater control over its management of poor relief, including the power to set up a workhouse for the elderly and infirm and children. The formation of the Union was officially registered on 19th February, 1798. Other members of the incorporation were Hartley Wintney from 1798 to 1827, and Eversley from 1802 to 1806. The Farnborough House of Industry was erected at the north side of what is now Union Road, formerly known as Workhouse Lane, and could could accommodate around 50 inmates. It appears to have consisted of a T-shaped nain building, facing to the east, with a separate block to the north. Its location and layout are shown on the 1880 map below. Farnborough workhouse from the west, c.1967. ©Hampshire Library & Information Service. Because of its status as a Gilbert Union, Farnborough fell outside most of the provisions of the 1834 Poor Law Amendment Act. It continued in operation until 1869 when all remaining Gilbert Unions were dissolved. 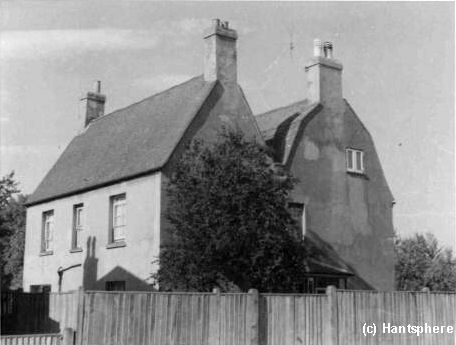 The parishes in the Farnborough Gilbert Union were then absorbed by the Hartley Wintney Poor Law Union. The building was sold off and became a residence known as Wilmot House. It was demolished in the 1980s. Hampshire Record Office, Sussex Street, Winchester SO23 8TH. Limited holdings comprise: Minutes (1837-57); Accounts (1794-1828).